“Intelligence plus character – that is the goal of true education.” Martin Luther King, Jr.
Martin Luther King, Jr. Charter School of Excellence prepares kindergarten-through-5th grade students of Springfield for academic success and engaged citizenship through insistence on rigorous, challenging work. The school incorporates Dr. King’s commitment to the highest standards in scholarship, civic participation and the ideal of the beloved community. 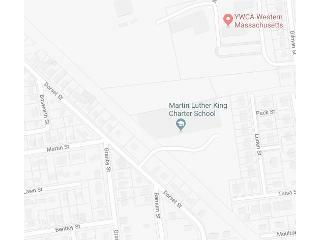 Martin Luther King, Jr. Charter School of Excellence (MLKCSE) is a stand-alone free and public charter school serving 370 students in grades K through 5 in Springfield, Massachusetts. MLKCSE was founded in 2006 and is dedicated to fighting the opportunity gap in Western MA. We are committed to providing each and every one of our students with the quality education they deserve. MLKCSE is a Title I school. Our MLKCSE students are 34.7% African American and 58.3% Hispanic. 100% of our students qualify for free or reduced-price breakfast and lunch. 24.2% of our students are Emerging Bilingual students and 18.8% of our students have special needs. Our school is meeting or exceeding targets for most (93%) accountability measures. Overall, our school performs better than 60% of elementary and middle schools statewide at the 61st percentile. MLKCSE is ranked one of the six charter schools in Massachusetts to be meeting more than 75% of the criterion-reference targets. MLKCSE ranked as the 4th highest charter school in the State for our math performance. The Dean of Students at MLKCSE shares our school’s mission and is committed to working collaboratively with the school’s Principal and Director of Operations to ensure that all students demonstrate dramatic student achievement gains and internalize the school’s values. They are committed to a high-standards, achievement-oriented school culture where students flourish. This individual will also help lead the school’s efforts to maintain a joyful, highly structured, consistent, caring, and routinized school culture. The Dean of Students at MLKCSE is passionate about social and restorative justice. They have a growth mindset about all of our students. They challenge and support them each and every day to be their best selves. The Dean of Students is an inspiring leader with a strong work ethic, is dependable, and is a team player. The Dean of Students models how to build strong, mutually respectful relationships with students and families and supports teachers and staff to do the same. This position is a member of the Leadership team. Salary is competitive and based on experience and education. Our community and students are diverse, and we are committed to reflecting that diversity in our staff. We strive to have the most diverse applicant pool possible and encourage individuals of all backgrounds to apply for any position at MLKCSE. By fostering a diverse and inclusive environment, we provide the best educational experience to prepare our students for a future reflective of the world we live in. Welcome to Martin Luther King, Jr. Charter School of Excellence! Martin Luther King, Jr. Charter School of Excellence is committed to maintaining a work and learning environment free from discrimination on the basis of race, color, religion, national origin, pregnancy, gender identity, sexual orientation, marital/civil union status, ancestry, place of birth, age, citizenship status, veteran status, political affiliation, genetic information or disability, as defined and required by state and federal laws. Additionally, we prohibit retaliation against individuals who oppose such discrimination and harassment or who participate in an equal opportunity investigation.